You are just a few fresh vegetables, a cutting board, and knife away from your next scrumptious summer salad. I made the most delightful salad the other day and I just can’t seem to get enough of it. I’ve been consumed with eating fresh corn and cucumber salad lately. If you are like me and you happen to have a little vegetable garden growing in your backyard, then you are probably enjoying a plethora of crunchy little cucumbers about now. We are gathering about 3-4 cucumbers a day and I can tell by all of the darling little yellow blossoms smattering about, that we will be enjoying bushels more as summer marches on. A few days ago, as the clock wearily stretched its hands to touch high noon, I stood in front of the fridge gazing upon its contents as I relished in the cold air spilling out onto my body. I was hungry for something cool and crisp, yet savory and satisfying. The stifling hot summer days are a reminder to fuel my body with the gardens’ fresh bounty that leaves me feeling energized and satisfied rather than heavy and sluggish. My eyes spied the romaine lettuce and I knew a salad was exactly what I needed to escape the blistering heat. And I began to slice the cool, crisp lettuce into thin ribbons of celadon green. A calm washed over me as I became aware of the sound of the sharp steel knife cutting through the ridged leaves. I cleared the cutting board of the ribbons of lettuce and sprinkled them into my beloved grandmother’s white ceramic bowl. A smile spread across my lips as I imagined how many times she prepared her salads while the bowl had residence in her kitchen. I rinsed a few freshly picked cucumbers under ice cold water and then cut them into thin slices. Before pouring the cucumbers onto the ribbons of lettuce, the sweet, fresh cucumber smell wafted up into my nostrils. For a fleeting moment I considered rubbing the slices onto my neck and wrists as perfume. I could smell that phenomenal scent all day long. We had leftover corn on the cob from our supper the night before beckoning to be enjoyed for one meal more. 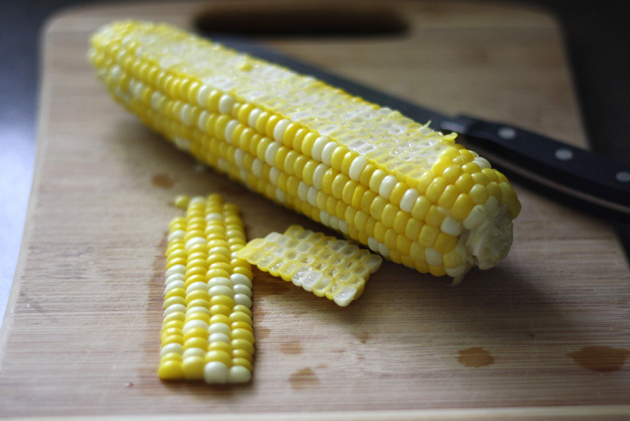 So I placed an ear on the cutting board and ran my knife tenderly along the cob to release the sweet, juicy kernels. I used my fingers to gently pop them apart from their tightly snuggled rows as they tumbled into my grandmother’s bowl. I took a step back to admire the colors and textures that were to become my midday meal. As I turned to the faucet to wash the starchy corn juices that were still clinging to my fingers, I noticed the fresh basil that I have resting in a glass vase beside the sink. I plucked off a couple of emerald green leaves, rolled them up, and ran my knife through the tube, releasing the most intoxicating fragrance. I stood there, eyes closed, knife in hand, letting the sweet, spicy, aroma intoxicate my senses until I felt almost dizzy. I then became aware of the ticking of the clock on the wall that pierced the hot silence in a steady tempo. I awakened from my trance and carried on. It was time for the finishing touches to adorn my fresh summer salad. 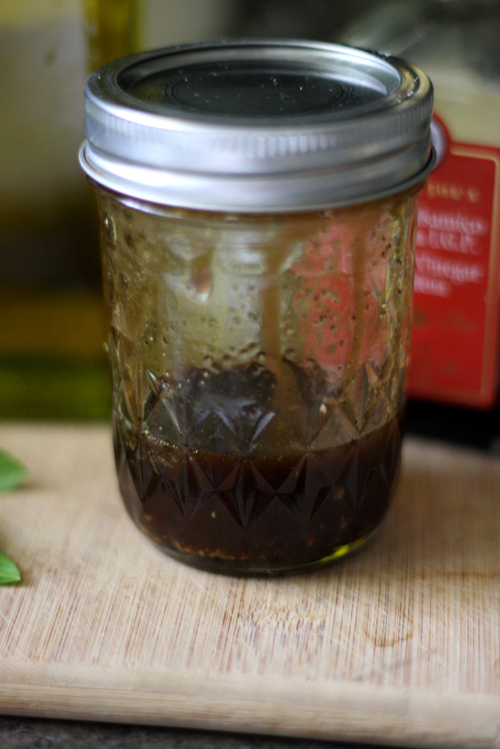 And then added some rich, smooth, balsamic vinegar. 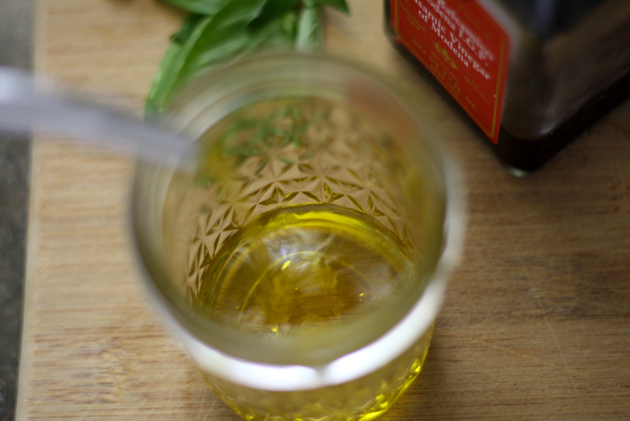 Until the few simple, luscious ingredients emulsified and then, became one. I twisted the lid counterclockwise and poured the tangy, vibrant dressing onto the fresh salad waiting patiently in my grandmother’s bowl. 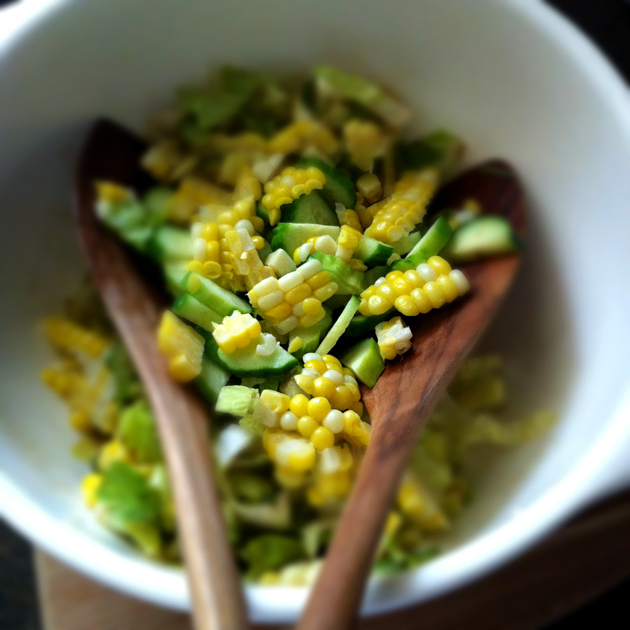 Slowly I tossed the vegetables with my favorite bamboo salad spoons. I gathered the salad up and let it tumble into a bowl. I admired the colors and textures. I breathed in the fabulous flavors. I pinched a sampling of salad between my fore finger and thumb and dropped it into my mouth. 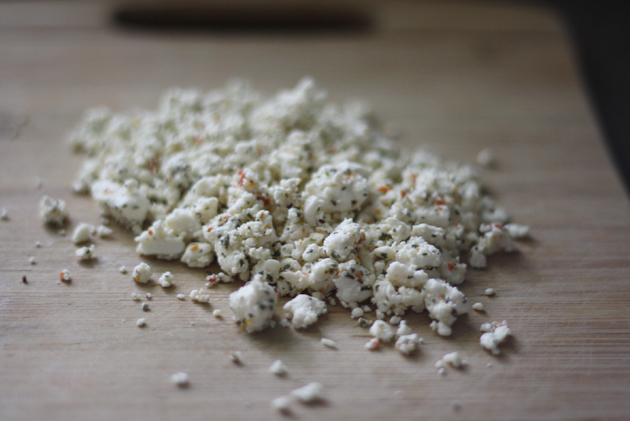 I decided that a smattering of salty, tomato & basil crumbled feta would be the perfect finishing touch. 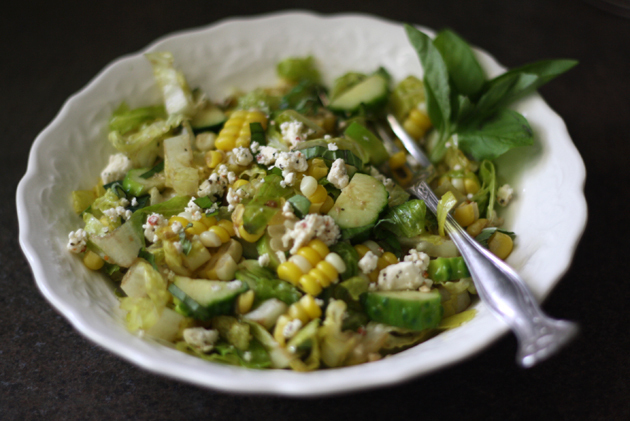 My smoldering hot summer day found delicious relief with a simple summer salad that made me swoon. Wishing you a forkful of summertime goodness. Cut romaine lettuce into thin ribbons. 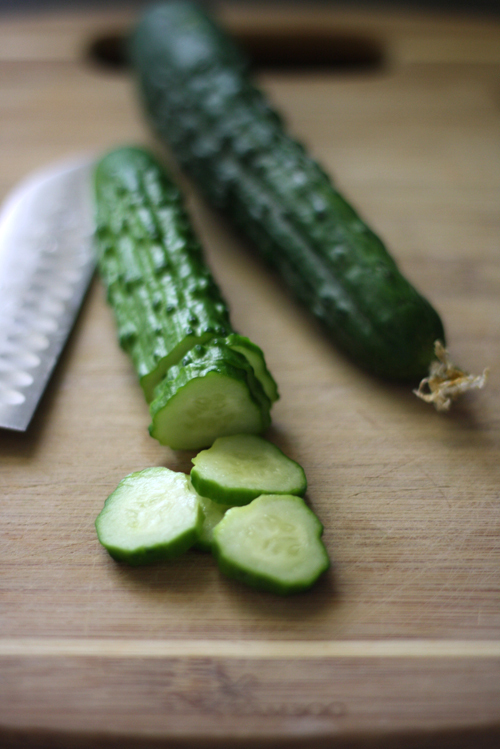 Slice cucumbers into thin rounds. Cut corn from cob. 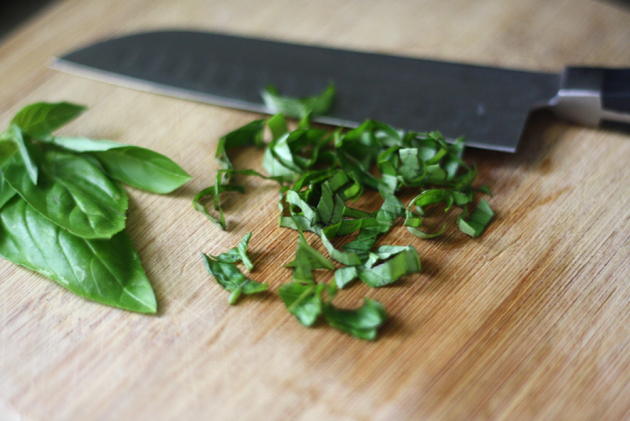 Roll basil leaves into a tube and cut into thin ribbons. Place all ingredients into a bowl and toss. 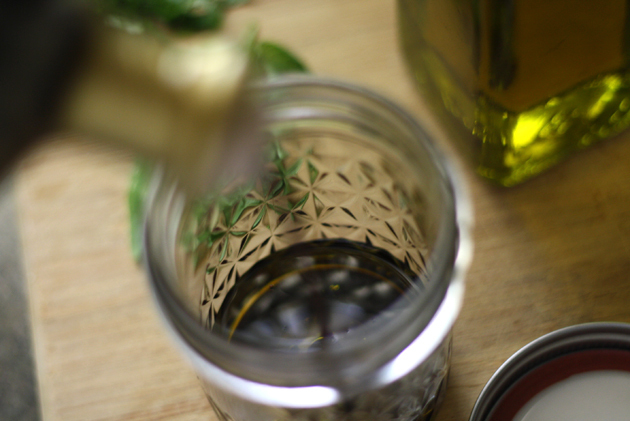 Pour olive oil & balsamic vinegar into a Ball glass jar (or other container) add salt & pepper and vigorously shake until emulsified. Pour onto salad. Toss again until salad is coated. My cucumber plant is OUT OF CONTROL !!!!! , just picked 6 cucumbers this morning and have lost count with how many more to come, every branch of the plant has a little baby cucumber waiting to grow and be enjoyed . 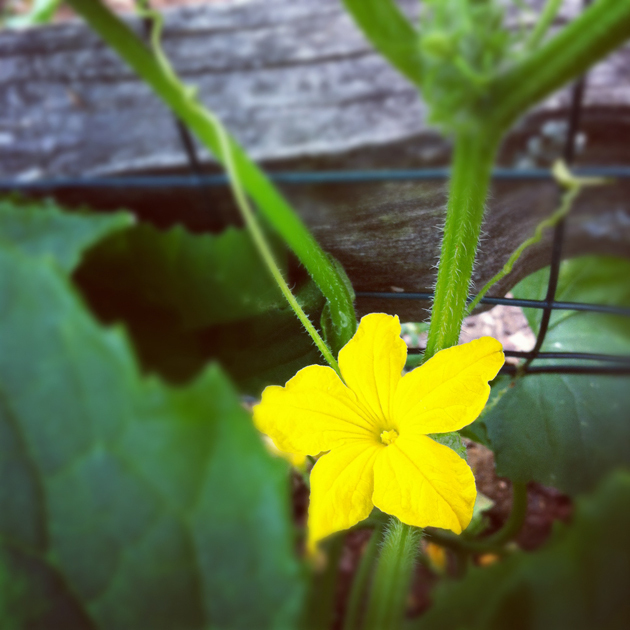 Although I have been told that every flower does not mean you will get a cucumber , I think they may have it wrong . Wendy…I can smell those cucumbers from here…gosh, this salad looks so fresh. I can’t stop thinking about it. This is definitely summer in a bowl. These are the types of salads I love. And I love the way homegrown cucs look all rimply-dimply and rustic. And that flavored feta, I gotta find that! Love this! So refreshing! Pinning for future reference! 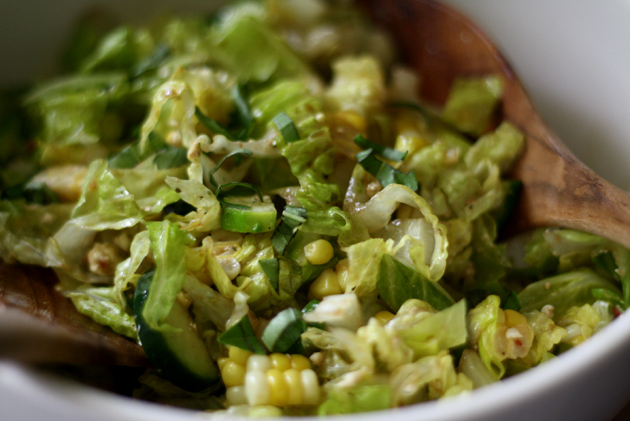 Ahh….THAT is summer in a bowl! Love cucumber, too….it IS so refreshing! Love that dressing in a jar, too!!! This looks great! Saw it on Pinterest, so I thought I’d check the original source. Lovely blog. This salad screams summer!! I love it 🙂 It’s fresh, easy, healthy and sounds delicious. I can’t wait to make this! Thank you. Sounds heavenly- I can’t wait for our corn to ripen! What a great salad! Thanks for sharing. 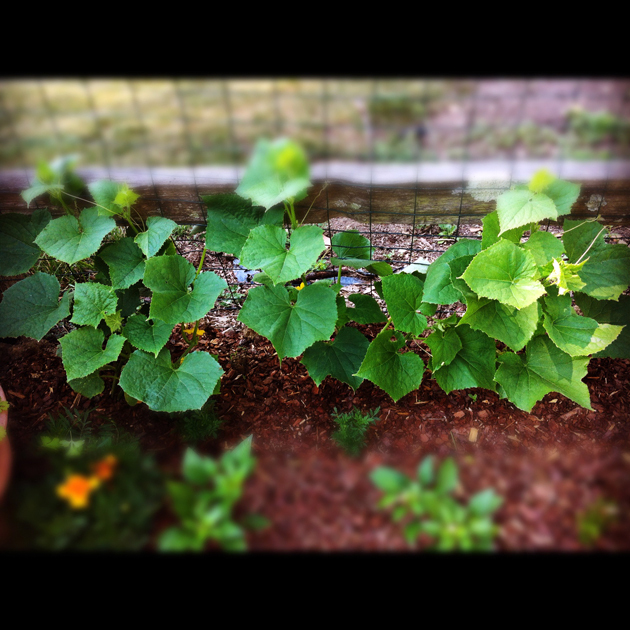 My cucumbers are going crazy and we are getting between 8 and 14 every 2-3 days. Needless to say, I needed a new cucumber recipe and this will fit the bill. Thanks! Darlin’ I am coming to your garden because that is one lovely fresh salad you have going on there. YUM! I am so going to make this! So simple and delish I’m sure. What a beautiful salad, Wendy! Those cucumbers looks fantastic…I really need to plant some next year. Such a beautiful summer salad!!! Loved following your adventures last week on the PW Ranch 🙂 Hope you are having a great day! 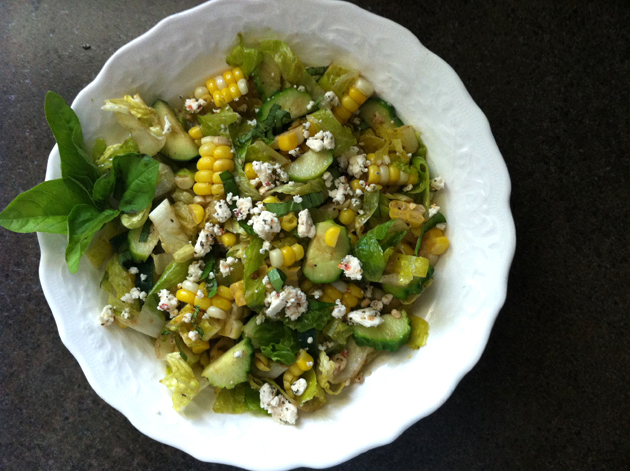 Made this last night.. it was yummy yummy – love the addition of the feta and the crunch of the corn! This is a keeper that I will be making often – thanks! Gorgeous! I don’t know how I missed this a couple of weeks back, but whoa. It looks perfect. I found you through Ree..and so glad I did. That looks awesome. I’ve got everything at home. Gonna make tomorrow for lunch. Yummy!!! Thanks for your recipe! I made it for a nice spring birthday party, just added a few heirloom tomatoes. It was a big hit. The basil was pretty awesome.